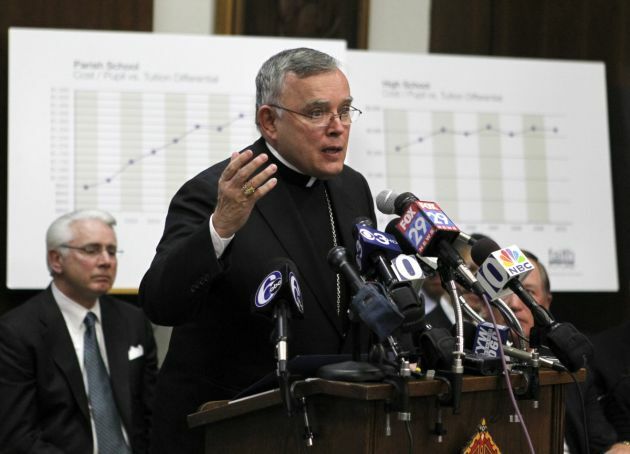 (Photo: REUTERS / Tim Shaffer)Archbishop of the Diocese of Philadelphia Charles J. Chaput makes remarks during a news conference to announce the closing of 48 diocesan schools at the diocese headquarters in Philadelphia, Pennsylvania January 6, 2012. Church leaders and members of a special blue-ribbon commission on Catholic education announced their decision to recommend the closing of 4 diocesan high schools and 44 elementary schools. Philadelphia's Catholic Archbishop Charles Chaput has welcomed Pennsylvania governor Tom Wolf's decision to effectively suspend the death penalty in the state due to the flawed nature of the system. The moratorium "will remain in effect until the governor has received and reviewed the forthcoming report of the Pennsylvania Task Force and Advisory Commission on Capital Punishment," Wolf's office announced Feb. 13. Archbishop Chaput praised Wolf for his decision, saying, "I'm very grateful to Governor Wolf for choosing to take a deeper look into these studies and I pray we can find a better way to punish those who are guilty of these crimes," Catholic News Agency reported Feb. 14. "This moratorium is in no way an expression of sympathy for the guilty on death row, all of whom have been convicted of committing heinous crimes," Wolf said in a statement. He stated, "This decision is based on a flawed system that has been proven to be an endless cycle of court proceedings as well as ineffective, unjust, and expensive. "Since the reinstatement of the death penalty, 150 people have been exonerated from death row nationwide, including six men in Pennsylvania." Chaput noted, "Turning away from capital punishment does not diminish our support for the families of murder victims. They bear a terrible burden of grief and they rightly demand justice. "But killing the guilty does not honor the dead nor does it ennoble the living. When we take a guilty person's life we only add to the violence in an already violent culture and we demean our own dignity in the process." The Pennsylvania governor said that an advisory commission will study the effectiveness of capital punishment, and the moratorium would be in place until "all concerns are addressed satisfactorily." Wolf is a Democratic Party member and took office on Jan. 20. He granted a temporary reprieve to Terrance Williams, who was to have been executed March 4. The governor's office said that as each death row inmate's execution is scheduled, Wolf will grant a reprieve, but not a commutation. Pennsylvania, which has a population of 12.7 million people has not executed an inmate since 1999 and has carried out only three executions since 1976. It is one of the least-active U.S. states with the death penalty. Conversely, however, it has one of the largest numbers of inmates on death-row. The Pennsylvania Department of Corrections says there are 186 people currently on death row in the state. It trails California, Florida, Texas and Alabama with its death row population. Some of Pennsylvania's inmates have been there for more than three decades. Washington state suspended the death penalty in 2104 without officially banning it, The Washington Post newspaper reports. The state Maryland abolished capital punishment in 2013 and, last year, said that four inmates still on death row would have their death sentences lifted. There are currently 18 states without the United States death penalty, and one third of them have banned the practice since 2007. Archbishop Chaput had praised a Philadelphia judge in 2012, when he stayed Williams' scheduled execution, sending the case to the Pennsylvania Supreme Court. In column of his published Sept. 10, 2012 column, the archbishop noted that even convicted murderers "retain their God-given dignity as human beings," CNA reported. "We don't need to kill people to protect society or punish the guilty," he wrote. He added that "we need to end the death penalty now" saying it does not heal or redress wounds, "because only forgiveness can do that."